The new Buzzard 4GEE car WiFi device is free on plans from £15 per month (24 Months), it makes car journeys more fun and entertaining for everyone you’re travelling with. Designed specifically to be used in the car, it plugs into your 12 volt power socket which means it’ll never run out of power and you don’t need to remember to recharge it. 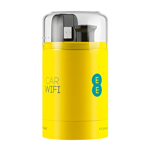 Car WiFi from EE supports up to 10 WiFi enabled devices at once (like tablets and laptops), so everyone in the car can go online at the same time. Car WiFi works on our 4GEE network, which currently delivers superfast 4G to 200 towns and cities – that’s over 72% of the UK population. And we’re on track to cover 98% of the population by the end of 2014. And even if your journey takes you out of a 4G area, you’ll still get great internet coverage with EE’s 3G network.